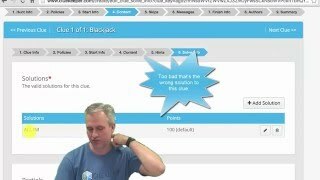 Watch this six part tutorial if you are just getting started as a creator for ClueKeeper. Learn by doing as you follow along with the videos and create your own personal hosted hunt. Learn how to become a creator, see what tools you'll need, and watch a demo of the simple hosted hunt that you will be making. 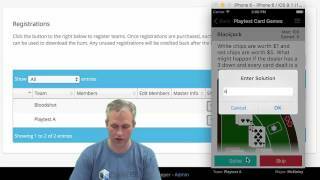 Get started making the Card Games hunt, working through the Hunt Info, Policies, and Start Info tabs. 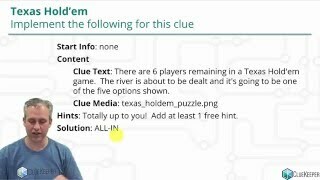 Create your first clue as you learn to add clue text, clue media, hints, and a solution. White chips are worth $1 and red chips are worth $5. What might happen if the dealer has a 3 down and every card dealt is a 10? 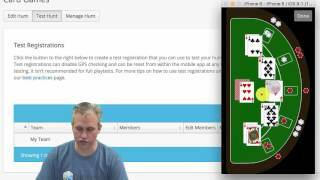 Learn how to test your Card Games hunt as you go on a real device using a free test registration. 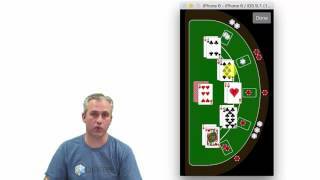 Create the Texas Hold'em and Euchre clues, and learn about the Hunt Issues tab. There are 6 players remaining in a Texas Hold'em game. The river is about to be dealt and it's going to be one of the five options shown. Assuming spades is trump, sort the euchre hand shown below, putting the most powerful card first. If you don't know euchre, you can look it up (or just start guessing anagrams). 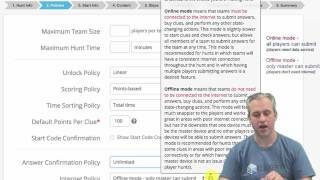 Learn more about best practices for hosted hunts, including playtesting and running your hunt with real teams. Click here to visit the best practices guide.